Scary Movie is a series of American horror comedy parody films created by Keenen Ivory Wayans with his younger brothers, Shawn Wayans and Marlon Wayans, that mainly specialize in parodying horror films, which have collectively grossed over $895 million at the box-office worldwide. The two main recurring actors of the first four installments were Anna Faris and Regina Hall as Cindy Campbell and Brenda Meeks, joined by new or recurring actors and characters. The franchise was developed by The Wayans Brothers, who wrote and directed the first two films before leaving the franchise. Their entries were produced by Dimension Films and distributed by two different studios: Miramax Films, as it was originally the studio's genre film label during executive producers Bob and Harvey Weinstein's run and produced the first three films, and The Weinstein Company—the brothers' subsequently formed studio—which produced the rest of the series' release after the Weinsteins departed Miramax and took the Dimension label with them. The franchise had one film in 2013 with Scary Movie 5, which features entirely new characters in a revamped storyline. Scary Movie is the first film that premiered in the series. 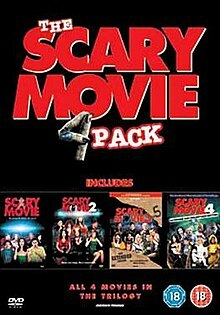 Scary Movie was the highest-grossing film of the series, grossing $278,019,771 worldwide. It is a spoof of several films, with a focus on the Scream series and I Know What You Did Last Summer series. After a group of teenagers (consisting of Cindy Campbell (Anna Faris), Bobby Prinze (Jon Abrahams), Buffy Gilmore (Shannon Elizabeth), Greg Phillipe (Lochlyn Munro), Ray Wilkins (Shawn Wayans), and Brenda Meeks (Regina Hall) accidentally hit an old man with their car, they decide to dump his body in a lake and never talk about it again (in a spoof of I Know What You Did Last Summer). A year later a person with a Scream mask kills them one by one. Scary Movie 2 is the second in the franchise. It grossed $141,220,678 worldwide with $71,308,997 in the U.S. This is the last installment in the Scary Movie films to receive an R-rating and also marks the end of the Wayans siblings' involvement with the series. The film starts with a parody of The Exorcist, in which Megan Voorhees (sharing the same last name as the fictional serial killer Jason Voorhees) is possessed by Hugh Kane, and two priests, Father McFeely and Father Harris (James Woods and Andy Richter) have to force Hugh Kane out. But after Megan insults Harris's mother he shoots her in the head. Cindy, Brenda, Ray, and Shorty return in this film. Greg, Buffy, and Bobby are replaced by Buddy (Christopher Masterson), Theo (Kathleen Robertson), and Alex (Tori Spelling). The film then merges into a parody of The Haunting with story beginning when a perverted college professor, Professor Oldman (Tim Curry) and his wheel-chair bound assistant, Dwight (David Cross), plan to study ghosts inside a haunted mansion with the clueless teens as bait. When at the house, strange things happen, Ray gets attacked by a clown (whom he also rapes), Shorty gets attacked by a living marijuana plant, Cindy gets in a fight with a possessed cat, and Dwight has an argument with a bad mouthed pet bird. When they find out about the professor's plan they try to escape the house, finding out that there is a ghost who still lives in the house. They must defeat the ghost in order to escape. Scary Movie 3 is the third film in the series. With $220,673,217 earned worldwide, it is the second most successful film in the series. The plot of the film is a spoof of The Ring and Signs as well as several other films and celebrities. Michael Jackson planned to sue the filmmakers for parodying him in such a way that made him seem like a child molester and having a fake nose. This was the first Scary Movie film to receive a PG-13 rating in the United States as well as the first to have no involvement from the Wayans family. The film revolves around strange crop circles found near an old farm and the circulation of an unusual videotape. Upon watching this tape, the phone rings and a creepy voice says: "You're going to die in seven days." Cindy falls in love with a rapper named George (Simon Rex) (a parody of Jimmy "B-Rabbit" Smith Jr. of 8 Mile), when she hears that she is to die in seven days. Meanwhile, George and his older brother Tom (Charlie Sheen) - the farmers who discovered the crop circles in their corn field - learn that extraterrestrials are coming to Earth come to destroy the killer responsible for the deaths of those who have watched the tape. Scary Movie 4 is the fourth in the series. The film opened with $40 Million at the weekend box office, making it the third best opening in the series. With a $178,049,620 at the worldwide box office, Scary Movie 4 ranks as the third highest grossing entry. The main target of spoof was War of the Worlds, Saw, The Village and The Grudge. The film concludes the story-arc that began with the first film and is also the last in the series to feature any of the original cast members. Scary Movie 5 is the fifth and final installment in the series and is the first film to not feature Anna Faris and Regina Hall. The film was panned by critics, and grossed $72,992,798 worldwide in the box office, thus being the least successful film in the franchise. Jody (Ashley Tisdale) and Dan Sanders (Simon Rex) move into a new home after adopting three mysterious children. There are video cameras to record the events, and Jody and Dan soon discover that a powerful creature known as "Mama" is haunting them, trying to claim their newly adopted children. Scary Movie's main parody is of Scream with elements of I Know What You Did Last Summer, The Sixth Sense, and The Matrix. Scary Movie 2 primarily targets The Haunting; the film's opening sequence is that of The Exorcist while the rest of the film contains traces of What Lies Beneath, Poltergeist, Titanic, The Amityville Horror and Charlie's Angels. Scary Movie 3's general parodies are The Ring and Signs. It also features The Others, Airplane!, 8 Mile, The Matrix Reloaded, and Minority Report. Scary Movie 4 largely makes fun of the Saw films (generally the first two), The Village, The Grudge, and War of the Worlds, as well as Million Dollar Baby, Brokeback Mountain, and President Bush's 9/11 book reading incident. Scary Movie 5's central areas of satire are the Paranormal Activity film series, Mama, Black Swan, and Rise of the Planet of the Apes. Other notable parodies are those of The Cabin in the Woods, Evil Dead, Fifty Shades of Grey, Inception, Sinister, and Madea. ^ "Boxofficemojo.com". Scary Movie, worldwide gross. Retrieved February 23, 2008. ^ a b "Boxofficemojo.com". Scary Movie 3 Worldwide Gross. Retrieved February 23, 2008. ^ "Starswelove.com". Angry Michael Jackson to Sue "Scary Movie 3". Retrieved February 23, 2008. ^ "Boxofficemojo.com". Scary Movie MPAA Rating. Retrieved February 23, 2008. ^ "Boxofficemojo.com". Scary Movie 2 MPAA Rating. Retrieved February 23, 2008. ^ "Scary Movie (2000)". Box Office Mojo. Amazon.com. ^ "Scary Movie 2 (2001)". Box Office Mojo. Amazon.com. ^ "Scary Movie 3 (2003)". Box Office Mojo. Amazon.com. ^ "Scary Movie 4 (2006)". Box Office Mojo. Amazon.com. ^ "Scary Movie 4 (2006)". The Numbers Box Office Data. ^ "Scary Movie 5 (2013)". Box Office Mojo. Amazon.com. ^ "Scary Movie 5 (2013)". The Numbers Box Office Data. ^ "Scary Movie". Rotten Tomatoes. Flixster. ^ "Scary Movie (2000): Reviews". Metacritic. CBS. ^ "Scary Movie 2". Rotten Tomatoes. Flixster. ^ "Scary Movie 2 (2001): Reviews". Metacritic. CBS. ^ "Scary Movie 3". Rotten Tomatoes. Flixster. ^ "Scary Movie 3 (2003): Reviews". Metacritic. CBS. ^ "Scary Movie 4". Rotten Tomatoes. Flixster. ^ "Scary Movie 4 (2006): Reviews". Metacritic. CBS. ^ "Scary Movie 5". Rotten Tomatoes. Flixster. ^ "Scary Movie 5 (2013): Reviews". Metacritic. CBS. This page was last edited on 20 April 2019, at 23:30 (UTC).